Looking back on our 5-string bass chart we decided it was time to remove two slightly older and harder to find models in the Ibanez SR405EQM and Fender Deluxe Dimension Bass V. Instead we brought in two new 5-string basses: the budget Ibanez GSR205 and the awesome high-end Yamaha TRBX605. Whether a 4-string bass limits your creativity, or you like a little more of a challenge, adding a 5-string bass guitar to your collection is an excellent move! Because 5-string bass guitars are a whole different ball game. You get a lot more in terms of tonal range, increased maneuvering space, and the ability to go to places you simply can’t get to with a standard 4-string bass. So if you are interested in finding your next 5-string bass, you’re in the right place. We have compiled a shortlist of eight of the best 5-string bass guitars on sale today, varying in price – from entry-level right up to the higher-end of the market. Another great SR model which delivers a great tone and looks awesome. A high-end versatile workhorse from Yamaha. An astounding higher-end Schecter bass that’s worth every penny. A real contender designed for serious work both in metal and elsewhere. Squier once again show that ‘affordable’ doesn’t need to mean ‘compromise’! Ibanez deliver a budget bass that sounds great! Simple entry level bass guitar that packs a decent amount of heat. Definitely one of the most balanced entry level five string bass guitars. 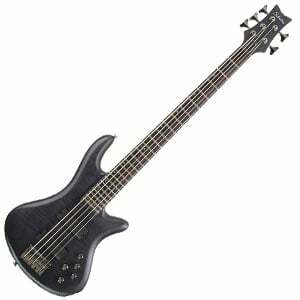 Ibanez is a household name when it comes to bass guitars in every segment of the market. Not only are their basses considered to be among the top-rated in their respective categories, but Ibanez has maintained such reputation for so long that people don’t even question their instruments anymore. Ibanez SR405EQM belongs to one of the oldest families of electric bass guitars that Ibanez has. For decades, SR has been the go to choice for professionals and amateurs alike. This particular model features a mighty set of humbuckers, a great EQ cluster to compliment them, and a design that just looks incredible. One glance at this bad boy will tell you it’s a quality instrument, there’s no doubt about it. For the type of money we are working with here, Ibanez SR405EQM is definitely at the top – if not the best choice on the market. While we all love Yamaha’s BB Series, it’s the brand’s new TRBX 600 Series that’s demanding a lot of attention – and for good reason. The TRBX605 is the 5-string part of this collection, offering huge power, an endless tonal range, and gorgeous looks that make it a real steal. It features the highly sculpted double-cutaway alder/maple body with no end to the smooth contours and sleek feel. This is the same feeling in the neck, which is a laminated five-piece maple/mahogany build with a 24-fret rosewood fretboard. Bass, mid and treble boost/cut, a pickup balancer and passive/active switching are just some of the highlights of this bass guitar’s incredibly versatile electronics – as we mention in the full TRBX605 review. The first of two Schecter basses on this list, their Stiletto Studio-5 Bass is the more premium – and a bass that justifies its slightly higher price tag. It sports a sleek and sophisticated design, with a double-cutaway beautifully-contoured body made from mahogany with a bubinga top. This is finished in either see-through black or satin honey. The maple and walnut neck is another highlight, with a thin C shape, deep Ultra Access design, and a fast satin finish, along with a rosewood fretboard and 24 extra jumbo frets. It is voiced by two passive EMG 40HZ humbuckers with 3-band active EQ, which – as we mention in our full review of the Stiletto Studio-5 Bass – offers an excellent sound worthy of gigging and recording. Schecter’s bass guitars are becoming more and more popular by the hour. A lot of people still live under the impression that metal is the only genre you can play one of these, but that has been proven to be wrong numerous times by now. Schecter Omen Extreme 5 is a perfect example of what you can expect to get from Schecter for less than $500. One look at this bass will tell you that you’re dealing with a quality instrument that sounds just as good as it looks. Speaking of which, the aesthetics of this model are something you usually see couple of categories north of where Omen Extreme 5 resides. Tone is balanced, versatile and comes with enough output to bring on the thunder. Even though Schecter is known for making metal axes, this model is more than capable of playing a variety of music genres. 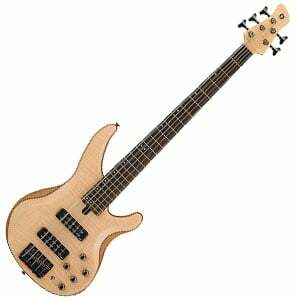 Overall, it is a great choice for a second bass, and an awesome one if you’re shopping for your fist bass guitar. Can’t afford the Fender Deluxe Dimension Bass on this list? You may be keen to check out this Affinity Series 5-String Jazz Bass, which offers true Fender style at a price only Squier can pull off. The double-cutaway Jazz Bass body is made from solid alder, with a bolt-on C-shaped neck, made of maple with a rosewood fretboard and 20 frets. It comes loaded with two pretty decent Jazz Bass V single-coil pickups at the bridge and middle, with two volume controls and a master tone control. As we mention in our full review of this Affinity Series 5-String Jazz Bass, the hardware isn’t jaw-dropping, but does the job – chrome bridge and tuners. Hard to complain about such an affordable 5-string bass! One of the more affordable basses on this list of fantastic 5-strings is the GSR205 from Ibanez’s budget branch, Gio. It features a nicely rounded double-cutaway body shape in a wide range of finish options. With a 34” scale length, the body is made of solid poplar while the slim bolt-on maple neck features a 22-fret jatoba fretboard with good playability. While the two Ibanez-designed pickups are relatively basic, they deliver a very good tone – especially for the sub-$300 price tag. It proves versatile enough for everything from heavy rock and metal (especially with the bass booster) to country and blues. You can check out all the details on the Ibanez GSR205 in the complete review. 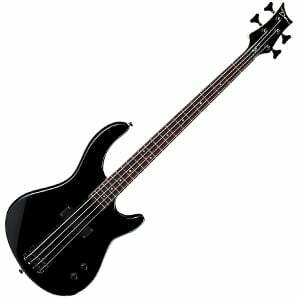 Affordable range of bass guitars has seen an influx of solid Dean models which have proven to deliver a great value for the money. Dean Edge 09 is what you can get in terms of five string basses for less than two hundred. On a similar note, Dean’s five string selection is maybe eve better than their four string basses in the sub $200 range. Check out our list to find out which models we are talking about. Overall, this thing is solid. It feature a basswood body, which isn’t all that unusual in the entry level category, and comes packing a single soap bar pickup. In terms of performance, you are going to be limited compared to a model that has a standard configuration of pickups, but there is still enough there to work with. The tone is good, full of girth and broadly flexible. However, this is definitely not a guitar for precision work. It lacks finesse, but that’s one of the tradeoffs you are going to have to make if you want spend less. Dean Edge 09 is perfect for metal, rock, and similar heavy genres. As a beginner bass guitar, this thing is a solid choice. Rogue is not one of those brands that hold as much authority as let’s say Ibanez, however they do deliver where other manufacturers can’t or won’t. In terms of affordable five string bass guitars, Rogue LX205B is one of the few that you can grab for under $200, but also one of the best. There’s nothing flashy about the LX205B. It features an average basswood body, a maple neck with a rosewood fretboard, but it comes with a decent set of single coils – one at the neck and one at the bridge. On the same note, you also get two volume controls and two tone controls. In terms of sound, Rogue LX205B has a lot of range for an affordable model. The tone is pretty well balanced and handles just about any genre of music with varying levels of success. For an entry level fives string bass, this axe is actually pretty impressive all things considered. You can count on Rogue LX205B keeping up with you even when you develop your skills and grow as a bass player. Switching to a 5-string bass can be an exciting step for any bass player – that extra string opens up a world of possibilities. And thankfully, as you’ve seen, there is a wide choice of basses that come in a 5-string model. We hope our shortlist has at least given you a quick insight into a cross-section of the most popular models out there, as well as a little inspiration when it comes to shopping around. Best of luck with your hunt for your ideal 5-string bass! My Stingray 5 HH is the best on the planet! I walk in the music store and don’t see any bass I’d rather play! I’ve had it over 5 years now. I really like the neck width. Only 1/8th inch wider than a 4-string. I’ve played semi-pro since 1976 when I bought a CBS (oh horror!) Fender Fretless P-Bass. Still have it, still play it! I currently play in 3 bands.